The home improvement and hospitality shows that fill up HGTV and Food Network’s lineups seem to exist just to make us feel bad about our unfinished sanding projects and/or misshapen holiday cookies. 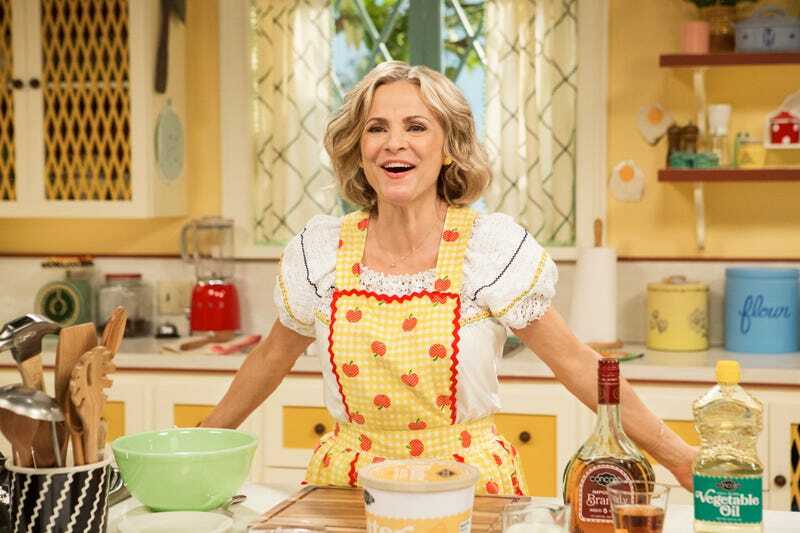 As an avid watcher of programs like Barefoot Contessa and its public-access counterparts, Amy Sedaris has also found those standards set impossibly high, which is what makes her new TruTV series as refreshing as it is hilarious. In At Home With Amy Sedaris, the actor-comedian crafts a comedy that defies easy categorization, but is often as darkly funny as her previous hits like Strangers With Candy. Sedaris and her frequent collaborator Paul Dinello co-created the half-hour hybrid, which is part comedy and part hospitality show, with a dollop of talk and a dash of variety. The first four episodes are well stocked with song-and-dance numbers and special guest stars, including Jane Krakowski, Rachel Dratch, and Sedaris and Dinello’s erstwhile partner in crime Stephen Colbert. There’s even the odd useful tip, i.e., peanut shells make excellent fingertips in a pinch, because despite the more absurd elements, Sedaris has an earnest desire to share her unique brand of hospitality. What she mixes up here is cozy and kooky, with a side of depravity. The show does a fair amount of world building, as we drop in on recurring characters who offer advice and advise caution from afar. But what you won’t find in At Home’s cupboards is any real intent to send up Martha Stewart. Despite Sedaris-as-host’s occasional ineptitude—she can readily identify the best glue for a crafting job, but can never really handle the bottle—the character isn’t poking fun at the domestic deities whose tables are always perfectly set for a scrumptious, from-scratch meal. Instead, At Home stakes out a corner in the hospitality genre where Guy Fieri acolytes, wannabe Top Chef contestants, and those whose kitchen experience is limited to a Great British Bake Off marathon are equally welcome. Its goal isn’t necessarily to make you a better cook or entertainer—though stringing some lightly painted popcorn to create cherry blossoms is an inspired move—but to make you laugh. That’s why there’s such a heavy helping of pre-taped sketches and asides, from crafting safety films with all the gravitas of vehicular-accident filmstrips from driver’s ed classes of yore to field pieces performed by Sedaris in character(s). One of those characters, a wealthy Southern woman named Patty, has a smidgen in common with (formerly) disgraced celebrity chef Paula Deen, but again, the real-life corollary is probably just incidental. When Sedaris spoke at the summer Television Critics Association press tour, she stressed her early fascination with women only slightly more prepossessing than herself sharing housekeeping tips with local TV viewers. Besides, racist controversy aside, there isn’t anyone folding napkins into swans on TV who’s anywhere near as demented as the host of At Home. This fictionalized version of Sedaris borrows heavily from her real life, weaving in elements like her pet rabbits and longstanding friendship with Colbert with bits about angel-of-death killers and an unnerving tinker. And there’s no guest star too creepy to miss out an invitation to break bread with this Sedaris, who strives to recreate Ina Garten’s presentation even though her life more closely resembles the Dimly Lit Meals For One Tumblr. At Home also tests the limits of Sedaris’ cheerfulness and hospitality, as nearly every fête has its mishaps, either in the form of leering businessmen or bodily injury. And in the process, it demonstrates what all these shows, hosts, carpenters, and cooks have in common: unwavering self-confidence. But the unrelenting optimism that’s key to the show’s charm is familiar for other reasons; it’s present in much of Sedaris’ previous work, from Strangers With Candy to BoJack Horseman. Jerri Blank, the “boozer, user, and loser” she played for three seasons on Comedy Central, had a similarly rosy view of the world, even as she struggled to fit in as a middle-aged high school student. Dinello, who wrote most of the episodes, helps make Amy a single-mindedly chipper hosting guru—that is, until a soufflé fails to rise or she can’t get any glue out of the damn bottle. Then it’s time for the toilet sangria, courtesy of one of several characters Sedaris plays. But she always bounces back, her resilience wisely creating a kind of emotional through line for the series. After all, regardless of the menu, you have to like your host in order to accept their invitation.